The UFRJ Science Park is an innovation environment inside UFRJ which allows the interaction between the university – students and technical and academic personnel – and the companies, turning knowledge into jobs and income and offering innovative products and services to society. Opened in 2003, it is comprised of research centers of innovative companies, UFRJ laboratories, a business incubator and areas for the development of entrepreneurship and integration. Located on one of UFRJ campuses, on Fundão Island, in Rio de Janeiro, and covering a 350-thousand-square meter area, the Park is a UFRJ project and is currently home to 68 institutions. Today, research centers of 15 national and multinational large companies are installed in the Park as well as 10 small and medium-sized companies, 10 UFRJ laboratories and 33 startups. 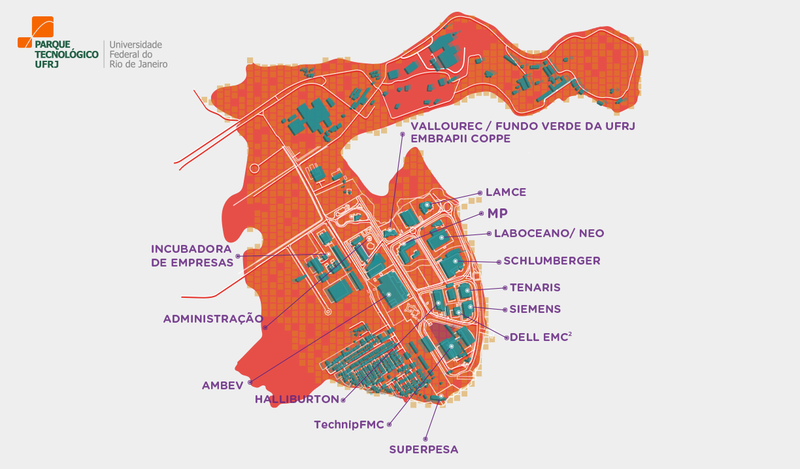 From the 15 large companies, two – GE and L´Oréal – are located on Bom Jesus Island, which is also part of the University campus. In the past year, two new innovation centers arrived in the Park: the Center of National Reference in Pharmacochemistry, from the Institute for Drug Technology (Farmanguinhos/Fiocruz) and the Institute for Innovation in Biosynthetics, from SENAI CETIQT. The Coppe/UFRJ Business Incubator is also installed in the Park, which is currently home to 29 startups. During its more than 20 years of activity, the Incubator has already supported the generation of 101 companies, responsible for the generation of more than 1380 highly qualified jobs. The Incubator is an environment specially designed to foster the development of new companies based on technological knowledge, a result of the work of UFRJ research groups. Elected as the best Brazilian Science Park in 2013 by the Brazilian Association of Science Parks and Business Incubators (Associação Nacional de Entidades Promotoras de Empreendimentos Inovadores – Anprotec), the UFRJ Science Park has a team specialized in promoting the interaction between its companies and the start ups of the Coppe/UFRJ Business Incubator with the university units/research groups, thus, facilitating the establishment of partnerships capable of promoting innovation. The Park also follows-up the management of the small and medium-sized companies installed in the Park and carries out activities to encourage the relationship between the resident organizations and other interested public. We also aim at helping expand the companies networking and foster entrepreneurship through business management activities and fundraising. In 2017, the Park started the Crowd Rio program, which consists in the acceleration of innovative enterprises in a partnership with Telefonica Open Future. A total of 9 startups participated in the first group of the program, which currently has 4 projects. The Park has also a coworking space, areas for events and places for students’ and professors’ entrepreneurial projects. The Park is currently home to the UFRJ Hub – a networked Laboratory for UFRJ experimental projects. More than just providing physical structure, the Park supports the Hub and other entrepreneurship-oriented activities through management activities and integration with the interested public. During the past years, the UFRJ Science Park has been strongly investing in two work fronts: attracting new companies from different economic sectors and expanding its activities beyond its physical borders. To this end, the Park has been establishing partnerships with other national and international innovation environments. Among them, are the partnership with other national and international innovation environments, such as the Scientific and Technological Park of the Catholic University of Rio Grande do Sul (Tecnopuc) and the Digital Port (Porto Digital), in Recife (PE), for the exchange of resident organizations and the partnership with TusPark (Tsinghua University Science Park) of the University of Tsinghua, China, which will allow the Park to have a permanent physical base in that country.